Journey to Kent and talk to Zero. 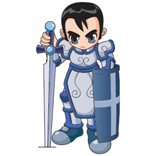 He will give you the task of defeating a Black Knight Search Party located in the vicinity of Kent Castle (area of Black Knight spawns outlined in the map below), and to return to him with a Search Document as proof of this feat. So, hunt Black Knight Search Party (not the same as a regular Black Knight) for the Search Document. Once you return the Search Document, Zero will reward you with a Red Cloak (-2 Base AC, +1 CHA, Safely Enchantable to +4) and send you to Gunter on Talking Island. 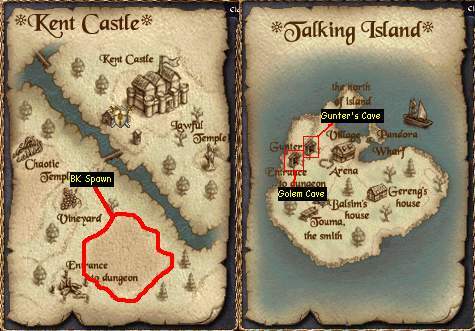 Visit Gunter in his cave (location outlined below) and he will tell you to head west to the dungeon (location outlined below) for him, and return a Secret of Life (dropped by Stone Golem). Do so and you'll be rewarded with a True Target Spellbook. Read this book to learn a spell which allows a prince(ss) to highlight a small area for his pledge for a short duration. This spell can come in handy in sieges, pledge hunts, etc. Qwazin: Secret of Life and Search Document can be obtained more than once and cannot be dropped or traded. Players can, however, sell them to NPC merchants in each town in exchange for a small amount of adena.